The 10 Best Wings in Missouri! No matter where you go, everyone likes hot, savory, tangy chicken wings. Missouri has excellent eateries, from high-quality chains to hole-in-the-wall dives, serving up wings like no one else can. Here are some of the best places to grab wings in the state. Coyote’s is modeled after the types of neighborhood taverns that used to be found in all the great American cities. Famous locally for its wings and burgers, Coyote’s inspires loyalty from its myriad regulars and attracts newcomers with its friendly staff and fun atmosphere. Find a booth, order some wings, and watch the game on the big screen. Hackett’s is a locally-owned wing joint, featuring homemade sauces and a flavor for every palate. Recently voted some of Missouri’s best wings by Missouri Life Magazine, this family-owned operation offers 13 different flavors and a lot of Memphis soul. Hot wings and cold beer—that’s what CJ’s serves to college students from the University of Missouri and anyone else who comes through their doors. Every sauce made in CJ’s is homemade from their own unique recipes. And although they have house-made ranch and bleu cheese dips, most customers say that they don’t want anything to mask the amazing flavor of the wings themselves. If you like it hot, don’t forget to try their hottest flavor—Burn Your Face Off wings. You can find some of the best wings in the state at Fallon’s, just outside of St. Louis. They are known for their corned beef sandwiches, but the wings are the best kept secret in town. Freshly made, hot, and with sauces that taste just a little bit unique, Fallon’s in one of the best places in the area to feast on wings. Although Springfield has more going on than just a couple of important colleges and universities, when a large group of college students tells you, “You have to talk about Bair’s”—you listen! These kids know wings like they know beer and pizza, and they say you can’t find better wings than the ones they serve at Bair’s. Bair’s is a local chain with fivef branches, and their wings come in over 20 flavors unique to their establishments. Just barely inside the Missouri state line, you’ll find Game Day Chicken Wings and Fish. A restaurant named for its two main dishes had better get those things right, and when it comes to wings, Game Day doesn’t disappoint. They serve wings as part of breakfast, lunch and dinner, and have their own take on the classic Buffalo sauce. People who come back more than once find that somehow, the wings get better every time they go. Choose from normal sized and jumbo wings. It’s hard to imagine a better evening than sitting on the dock next to the lake, sipping a cold beer, and munching a plate of delicious wings. That’s a daily occurrence at Coyote’s outside of Branson, on Tablerock Lake in Kimberling City. The boneless wings—called chicken bobbers—come in both Buffalo and barbeque flavors and are the perfect taste to conclude a day on the lake. The Locker Room in Rolla, not far from the University of Missouri-Rolla, serves wings and other fare at prices that college students can appreciate. This includes Wing Wednesdays, where wings are 40 cents each all night long. Although reviews call this place a “hole in the wall,” it’s our experience that holes in the walls are the best places to find homemade original recipe wings! 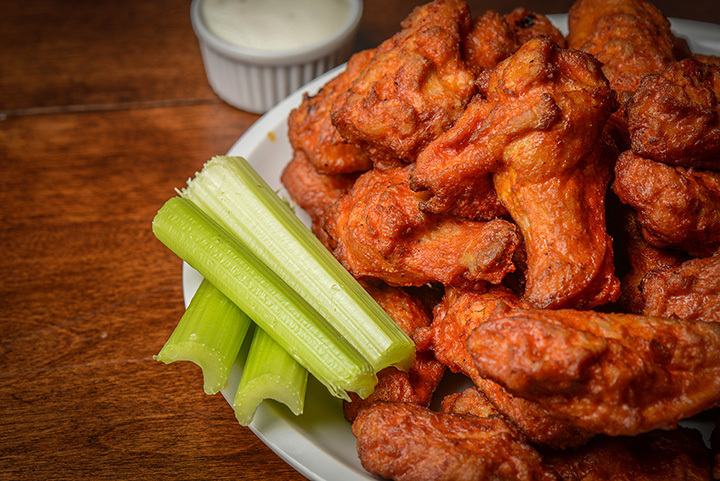 Syberg’s, which has four locations in St. Louis, is well known for superior pub food, but that’s especially true when it comes to wings. Their special wing sauce is unique and unparalleled, and is the reason people come back again and again. St. Louis has several major league teams in different sports, so make sure to ask about game-day specials! The Peanut claims to be the oldest bar and grill in Kansas City, and to have been a speak-easy during the depression. It’s definitely a winner in terms of atmosphere and history, and they continue that tradition with their famous wings. With unique in-house recipes formulated by a staff “wingologist,” The Peanut offers enormous wings—that are really wings plus legs—with a variety of signature dipping sauces. If you can’t get up to KC, you can have them shipped, fully cooked, right to your doorstep.